This week we present you an interview with one of our associates who is a role model in their area. Alina Cristian is sharing her journey and offering advice on how to achieve success. Loving what you do at work brings happiness and fulfillment but doing what you love surrounded by a great team who strives for excellence is a great achievement. This is how our colleague, Alina, inspires others every day to be the best versions of themselves. Below, you find her detailed trip in Office Depot. Even though OD takes a lot of time, energy and passion, I still have time after work. Lately, I keep a balance in managing work-life domains. I have a 5 years old daughter – she’s the light of my eyes – and I think she is the one who gives me energy to wake up in the morning and take on another day. Usually what I do in my free time is spending time with my daughter and my husband, drinking coffee and staying in the nature. Since 2015 I am Accounts Payable Operations Manager for the whole Europe. So, I just turned 2 years in the role. I coordinate around 70 people, 7 teams, 7 team leaders. 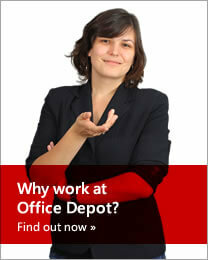 Indeed, I have a long history with Office Depot. It’s actually the place where I grew and developed my career. Maybe it will sound like a cliché but Office Depot is really home for me – it’s the place I feel extremely comfortable and I’ve never got bored because I have changed different roles. I moved from operations to performance improvement, process improvement, project management and then went back to operations. It was like a loop and even though I skipped some stages from individual contributor to managing a department, I will always appreciate Office Depot for the vote of trust they gave me. I joined OD in 2007 as a Process Specialist on credit & collection for UK. My responsibilities were to collect money for huge customers and managing their contracts with OD. Initially, I had a portfolio of customers that I had to take care of but after a few months I ended up having one big account – Network Rail Station. It was very nice because I was able to build a relationship with the accounts payable lady from there. Also, I was a deputy on behalf of my team leader. It was like my first day of school. I was nervous, happy for a new beginning but also having chills and butterflies in my stomach. I went to Muncii’s office and I had no idea what I was going to do. The boldest decision I ever made was to come to OD – it was not clear for me what I was going to do there. The good part was that I had on the floor some colleagues whom I knew and this made it a little bit familiar. The last two years were extremely challenging for the Accounts Payable Department, entailing a lot of hard work but also satisfaction for being able to improve our results and get better and better. We usually make fun of a complicated situation when we are right and the vendor is wrong. So, that is the definition for fun for us. The biggest achievement is Ana, my daughter. She brings the most joy and is something I’ve never imagined before. It’s a daily blessing! Now professionally, I take every step I made as an achievement. I couldn’t link it to a certain moment in my career but it’s more related to development – the way I grew in the company and became more mature. If I could phrase it as an achievement, it would be overcoming my limits that I would have never thought I would do. Two years ago when I started leading a department, I felt insecure and concerned, wondering if I would be able to succeed. Now, seeing my team and how we managed to build the department together I think this is the biggest achievement. I don’t have many rules. The first thing is the attitude – it doesn’t matter if you are a great performer if the attitude is not the right one. This is something that I apply when choosing who to work with. What I mean by attitude is getting involved, trying to learn as much as possible, thinking constructively, being open-minded and having passion. Also, even though I lacked expertise I compensated it with lot of hard work. I think the biggest challenge I had was to shut up and listen. One time a colleague started saying something and I didn’t agree with it. The biggest effort was to listen and not comment. I stood there for 15 minutes and let my colleague give me negative feedback. In the end it was the best thing that happened to our relationship and I felt like it was the ground 0. From that on, we started to have a great professional relationship. My team: I really like the people I work with. I’m really proud of how much we achieved with the team in 2 years. Our culture: the way we work together, how we are organized, the procedures, what we do for people and our values. One of the things that are important in my life and my mom told me is that at any moment in time you should be able to look in the mirror and not be ashamed of yourself. This is something that is reflected in everything I do in life. In professional life, I’m guided by passion – I put passion in everything I do, to do it right. This doesn’t mean that we shouldn’t make any mistakes but whatever you do, you do it the best you can.